100% certified natural. Certified natural skin care. For dry and rough skin. Feeding skin for 90 years. Dermatologically tested. 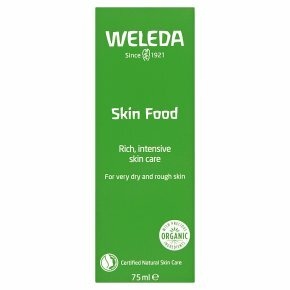 Skin Food Weleda Skin Food is a whole body cream for everyday care of dry and rough skin at any age. Formulated with plant extracts of viola, chamomile and calendula traditionally used to soothe the skin it helps restore smoothness after everyday surface damage. Areas that are especially dry, such as hands, feet, and elbows, are in-tensely cared-for, rendering your skin soft and smooth. Apply Weleda Skin Food several times a day.